The energies of Power, Love and Wisdom which arose during the first two spring festival full moons each year are focused and utilized for humanity at The Goodwill Festival. The resulting consciousness is then highly charged, and has a profound and far reaching magnetic effect. Due to the stimulation of this consciousness, contact with higher energies than previously available is now possible. This force produces vast results of a quieting nature and bringing, by reflex action, Peace on Earth. The transmutation of desire into aspiration and the transformation of earthly desire into spiritual desire will be among the effects, as we gain better control of the physical bodys hungers and wants. The coming Christ energy will demonstrate on the physical plane in the formation of active groups everywhere, which will work aggressively for unity, cooperation and brotherhood in all departments of life ~ economic, religious, social and scientific. Nations are the expressions today of the massed self-centeredness of a people and of their instinct to self-preservation. These energies can increase this aspect of national life or they can increase the potency of the objectives of World Unity, Peace and Progress which the United Nations holds before the eyes of humanity, as a true vision of the Plan. These constructive, synthesizing energies should have the effect of transforming the theory of Unity into practical experience so that the word "united" will come to hold a true significance and meaning for all nations. Today a will-to-synthesis is slowly generating within the General Assembly of the United Nations under the forces of reconstruction and the Avatar of Synthesis. With the keynote of "humanity, aspiring to God," this festival is also observed as the Festival of the Spirit of Humanity, and as World Invocation Day. 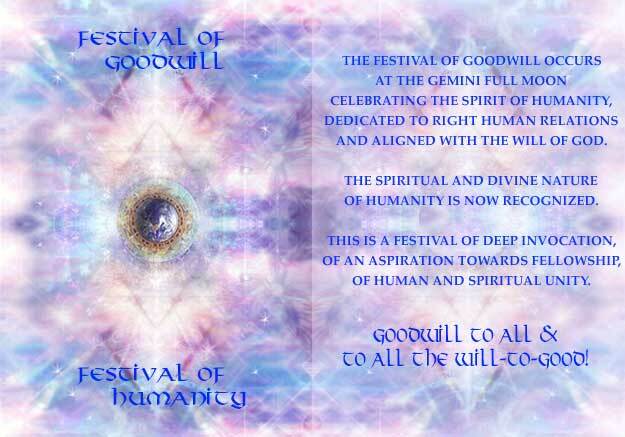 In the future all spiritual men and women will honor the same holy days. In a united prayerful effort they will produce a simultaneous voice that will have a potent effect in our world. Evidence of this has already begun to show itself. Since the August 1987 Harmonic Convergence, many global meditations have occurred and ALL with open eyes have witnessed changes in our world. Our continued participation in these three Spiritual Festivals assists humanity in achieving a Great Spiritual Unity throughout the Planet. At the full moon during Gemini ~ the time of The Goodwill Festival ~ the Hierarchy guided by The Christ showers the Will-to-Good upon Planet Earth. During the Wesak ceremony at the full moon during Taurus, The Buddha has become the absorber of Will. He uses the magnetic power of Love to attract this force and hold it steady, prior to redirecting it. On behalf of the Hierarchy, The Christ, acting as receiver of this potent energy, then becomes the director of this force at the Festival of Goodwill. 1. Power will be given to the disciples of the world and the initiates among humanity, so they can direct efficiently and wisely the process of rebuilding. 2. The Will to Love will stimulate people of goodwill everywhere, gradually overcoming hatred. The inner urge in humanity to live together cooperatively already exists, and is subject to stimulation. 3. The Will to Action will lead intelligent people throughout the world to begin those activities which will lay the foundation for a new, better and happier world. 4. The Will to Cooperate will steadily increase. People will desire and demand right human relationships as a natural way of life. 5. The Will to Know and to think correctly and creatively will become an outstanding characteristic of all humanity. Knowledge is the first step towards wisdom. 6. The Will to Persist will become a human characteristic ~ a sublimation of the basic instinct of self-preservation. This will lead to a persistent belief in the ideals presented by the world workers, and a true demonstration of immortality. 7. The Will to Organize will further a building process which will be carried forward under the inspiration of the world workers. The medium will be the potency of the will-to-good of this New Group of World Servers and the responsive goodwill of all people. For Inspiring Audio version of the following "Seven Great Results" (3:50) click here. For full instructions on listening to audio on the SouledOut.org website click here. occurs on Friday, June 9 at 6:10 am PDT / 13:10 UT.